FULTON – Caring Community Advocates of Oswego County, a group of local professionals and service providers dedicated to the health and well-being of our aging population, announces a series of events especially for older adults featuring games, guest speakers and information on a wide variety of topics, taking place at locations across Oswego County in the month of June. 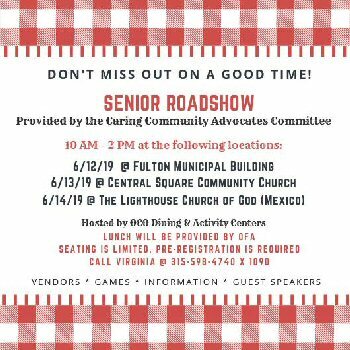 On June 12 from 10 a.m. – 2 p.m. the Senior Roadshow will take place at the Fulton Municipal Building. The theme will be “Financial Planning” and will feature guest speaker Tom Reynolds. He will speak about wills, health care proxy, power of attorney, and answer Medicaid questions. Additionally, the Oswego County Sherriff’s Department will have a medication disposal bin for attendees to bring their expired and unused medications to be disposed of safely and securely. Attendees will enjoy a delicious lunch, courtesy of the Oswego County Office for the Aging funded by federal and state grants through the New York State Office for the Aging and by Oswego County government. Vendors at the roadshow will include: Onondaga Community Living Advocates, Move Along, Fulton YMCA, St. Luke Health Services, United Health Care, North County Cancer Services Program, RSVP of Oswego County, Oswego County Health Department, Serving Seniors, ICircle, Oviatt Hearing, Oswego County Sherriff’s Department, Fulton Library, The Hearth, Franciscan Companies, Kindred At Home, St. Joseph’s Healthcare, Rural Health Network of Oswego County, Cornell Cooperative Extension, and Humana. Can’t make it to the Fulton location? No problem. There are two additional Senior Roadshows that week. Each event runs from 10 a.m. to 2 p.m., is free of charge and open to the public. Each venue will feature a different assortment of vendors/providers and activities; folks are welcome to attend any or all of the events. For more information about the Senior Roadshows, please contact Virginia Bough, Rural Health Network/DSRIP Program Specialist at 315-598-4740 extension 1090. 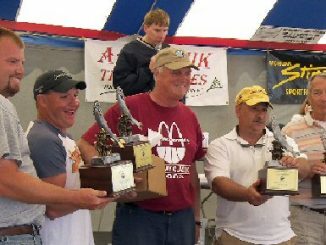 About Caring Community Advocates – Caring Community Advocates is a group of area service providers working under the auspices of the Oswego County Rural Health Network. Recently to group conducted a survey campaign to identify what was important to the aging population in regards to social needs, nutritional education, health/wellness needs, financial information, and medical resources. For more information, contact Bough.